- Invitation 5" x 7" or 4" x 6"
- Save the Date, 5x7" or 4x6"
- Thank you tags 2.75" x 4"
- Welcome tags 2.75" x 4"
No time limit to send me datails or small changes. 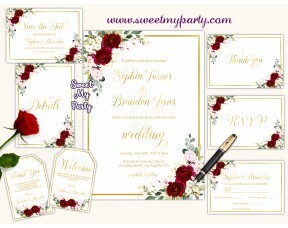 shop [at] sweetmyparty.com and I will write you back as soon as is possible. 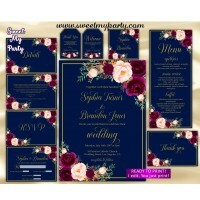 Invitation size --- Please Select --- 5"x7" 4"x6"
Save the Date size --- Please Select --- 5"x7" 4"x6"
Burgundy Wedding Invitation setCreate your own set! 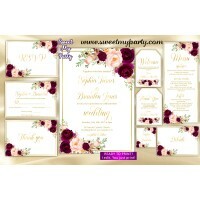 Choose the cards- Invitation 5" x 7" or 4" x 6"a..